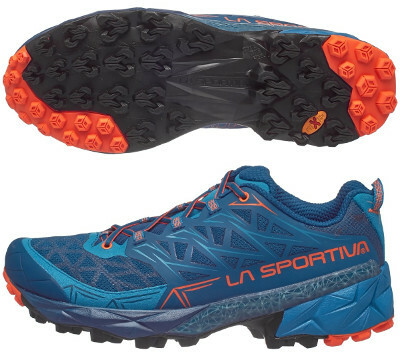 La Sportiva Akyra are neutral trail running shoes. The brand new La Sportiva Akyra joins long distance collection from the italian brand in addition to popular Ultra Raptor and powerful Akasha. The Akyra has been released with focus on technical terrains featuring 9 mm drop for a dynamic transition. The new Akyra tries to move away from rugged layout with 3 layer mesh for improved breathability and modern design based on multiple possibilities of fused elements. Long distances mean lot of time so it is mandatory to provide a really comfortable trail running shoe to enjoy the journey, including ergonomic 4 mm Ortholite insoles. Although not as much protection as the mentioned Ultra Raptor, toecap is reinforced to protect against external elements. As usual, there is a waterproof edition (Gore-Tex®) available for adverse weather conditions. There are many stretch marks in midsole of reliable injected EVA to better adapt to different terrain's irregularities and marketing pitch from La Sportiva claims it has been inspired by Origami art. Outsole has always been one of the highlights from italian brand and Akyra features a double density red FriXion XT, more consistent in external areas for increased durability with hexagonal lugs and softer in the inner areas for better grip with deeper lugs in the forefoot and inverted ones in the rear one to prevent skidding and improve downhill traction.